Winter is FINALLY gone and to celebrate, this Monday, PBS KIDS is airing a NEW one-hour special, "Curious George Swings Into Spring." My family is so glad to see spring arrive. We've been spending every possible moment outside. The kids have been riding bikes and chasing butterflies, and I have been gardening and maintaining my bird feeders and nest boxes. 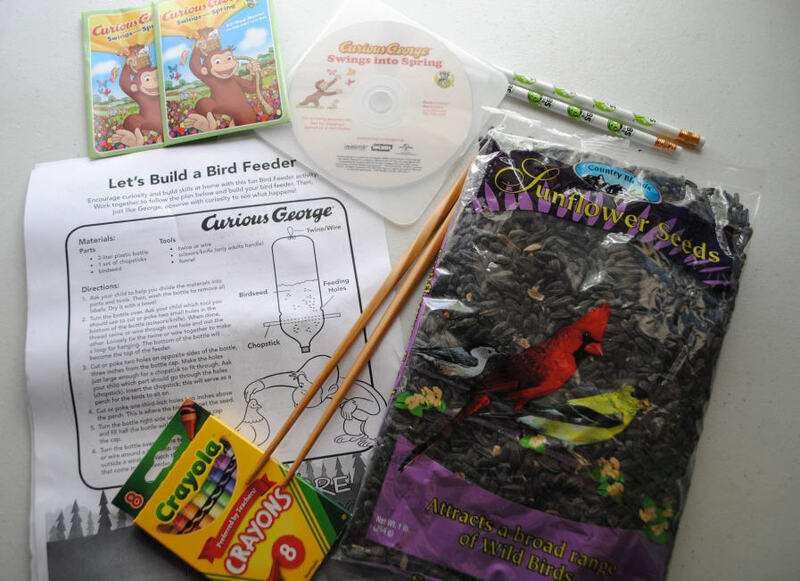 So when I received a Curious George Swings Into Spring activity kit and screener in the mail (I'm a PBS KIDS ambassador), I was happy to see what was in it... tomato seeds and a bag of birdseed! Hurrah! But what was even better than that were the activity sheets that show how to build a bird feeder from a 2 liter plastic bottle, a recycling challenge activity, a pinwheel craft, and coloring page. And you can find all of them, too, by simply clicking the links above. This week, we looked at all of the activity sheets, and my kids decided they want to make a bird feeder. We cheated a wee bit and used a drill to make the holes, but used closed scissors to widen them. And we also found that using a long pipe cleaner is actually a lot easier to thread back through the holes in the bottom of the bottle. 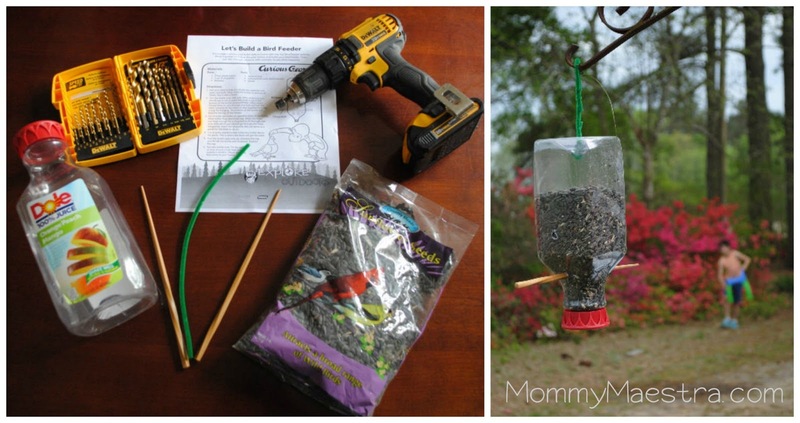 They're our favorite method for hanging bird feeders because the are strong, but easily bend. My daughter loved it so much she decided to set up a chair outside to watch the birds using it. My son decided to create his own activity using the tomato seeds. He quickly gathered up some eggshells that were leftover from our cascarones-making extravaganza. We had carefully emptied and washed them, so he just stuck them in an egg carton, widened the hole a bit, and started pouring potting soil inside each one using a little funnel made out of paper. Then he planted the tomato seeds and watered them all down. I'll have to post an update once they start growing. If you're looking for fun springtime activities to keep your kids busy, the ones I've linked to above are fun and educational. Or you can just let your child be creative and come up with his own ideas, like mine did. Are your children old enough (or still young enough?) to enjoy Curious George? Mine still are, and after watching the episode, my son said with pleasure, "Oh, that was a really sweet show." And it is little remarks like that which keep me a loyal fan of PBS. Here's a little sneak peek at the show..